This is Mepala and the picture below is taken at Slängsboda. We used to ride horses to the pasture like this and once when I was taking Mepala to the pasture Lolo's father started his aeroplane. I thought that now I'm going to bite the dust but she was calm as ever, didn't even flick her ears. So much for crazy Arabians... The picture above is taken at Wilza Arabstuteri. Mepala was imported in utero from Poland. 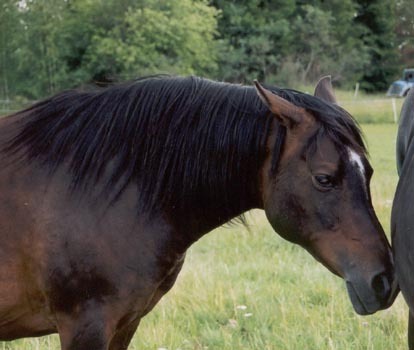 Her mother Melisa was by *Namiet out of *Moneta and belonged to the dam line of Sahara OA imp 1845 to Jarczowce. The strain is Kuhailan and the only direct line from Sahara OA is that from her daughter Sahara Slepka OA who was foaled in transit. Namiet also belonged to this family. Many members of this family perished in World War I and only two mares were saved, Pomponia 1902 and her daughter by Kohejlan OA, Zulejma 1914. After the war Pomponia had two more daughters, Dora 1922 by Bakszysz and Bona 1920 by Mazepa I. Of the postwar daughters, only Dora had any impact on the breed. Zulejma 1914 founded three branches of this family through her daughters Dziwa 1922, Ferja 1924 and Huryska 1926. Dziwa would have been covered in glory if she only had produced Ofir but beside him she produced two other stallions, Taki Pan and Jezupol, and the mares Mokka, Limba and *Niwka. 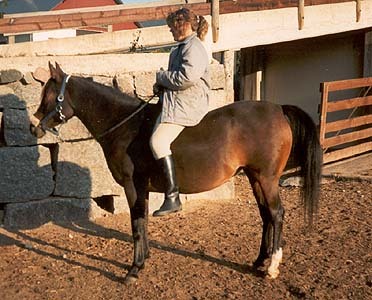 The branch of Mokka did not only produce Mepala but also other horses of swedish interest. Mokka's daughter Mokdiara produced *Diara Mokka by Wielki Szlem who was imported to Sweden with her daughter by Negatiw, *Diaspora. Mokdiara was the granddam of *Moneta who produced Melisa. The only remaining line from *Diara Mokka is that from her daughter Ex Diara. *Diara Mokka also produced the stallion Diamant by *Exelsjor, full brother to Ex Diara.